ALEX Toys Tin Tea Set Just $10.39! Down From $35! You are here: Home / Great Deals / Amazon Deals / ALEX Toys Tin Tea Set Just $10.39! Down From $35! Get Alex Toys Tin Tea Set at Amazon for just $10.39 down from $35 PLUS FREE shipping with Amazon Prime or for orders $25 or more! ALEX Toys Tin Tea Set is a 16-piece floral themed tin tea set that comes packed in a bright and beautifully printed case. Anytime is the perfect time for a tea party with this adorable set. Have all your friends and maybe even a family member over for a spot of tea. 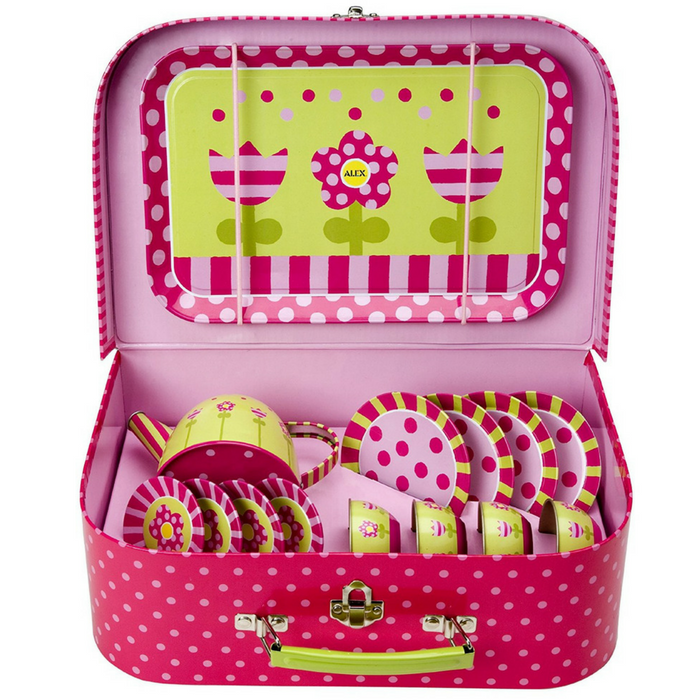 This tin tea set is both adorable and durable, so it’s perfect for young children. Little ones can even put together a precious party with real treats. The floral-printed dishes in this set are washable for an easy clean up. All pieces are safe, clean and perfect for indoor or outdoor play. Includes a floral theme pattern tin teapot with lid, 4 tin cups, 4 tin saucers, 4 tin plates, tin serving tray and carrying case.